The true mark of good design (aside from quality) is the ability to lend itself to a variety of environments and styles. A well-designed blazer will dress up jeans and heels as well as it would a smart pencil dress, a classic car design looks as impressive outside a high-rise apartment block as it does a grand manor and a timeless furniture piece will accommodate a range of decor styling. LuxDeco took the challenge to style (and restyle, and restyle again) a key addition of our Autumn Winter collection, FBC London’s incredible Aurora Coffee Table – a statement piece with unique silhouette and a cracked earth-inspired top (oak and walnut options are also available). Are you a minimalist, a fashionista or a rustic enthusiast? Discover our favourite coffee table styling ideas. Or perhaps you can take inspiration from designer Katharine Pooley’s own Chelsea townhouse. Perfect for fashion mavens, this look is all about high-impact glamour using pieces which make as much of a statement as the furniture they’re designed to decorate. 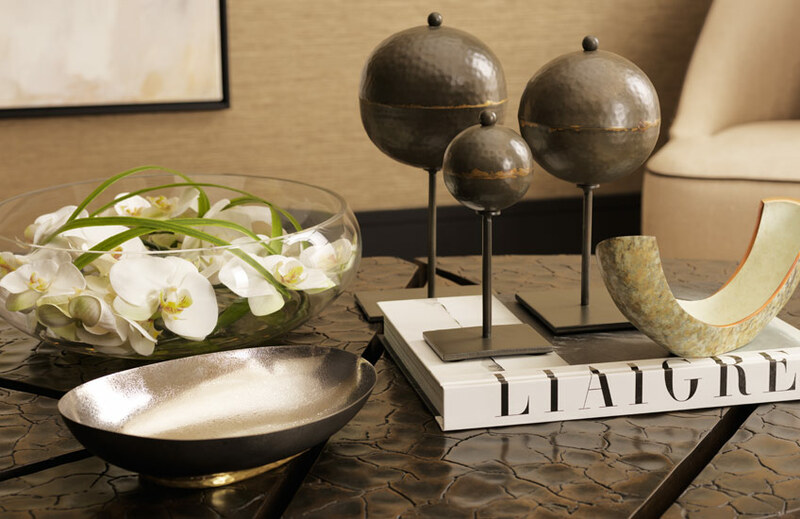 As jewellery is to an ensemble, home accents are to a coffee table. Balance an edgy aesthetic with a touch of pretty for the perfect runway-inspired look. Assouline’s stunning fashion monographs are the easiest way to channel your interest in the fashion world’s top houses and layer up your display. 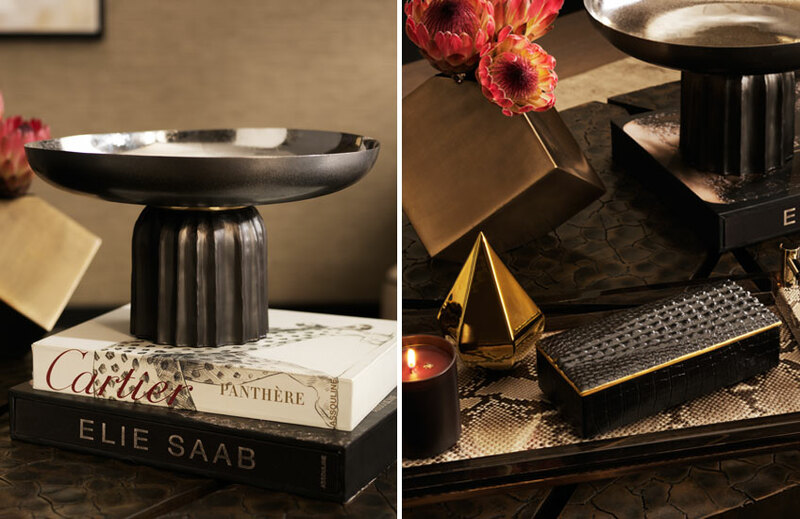 A trinket box (or two) are the living room equivalent of jewellery boxes and a tray with a candle and objet makes for a stylist-approved vignette. Although its inherent eclecticism endures, bohemian styling takes on a refined slant this season with gilded touches, polished finishes and luxurious scents. 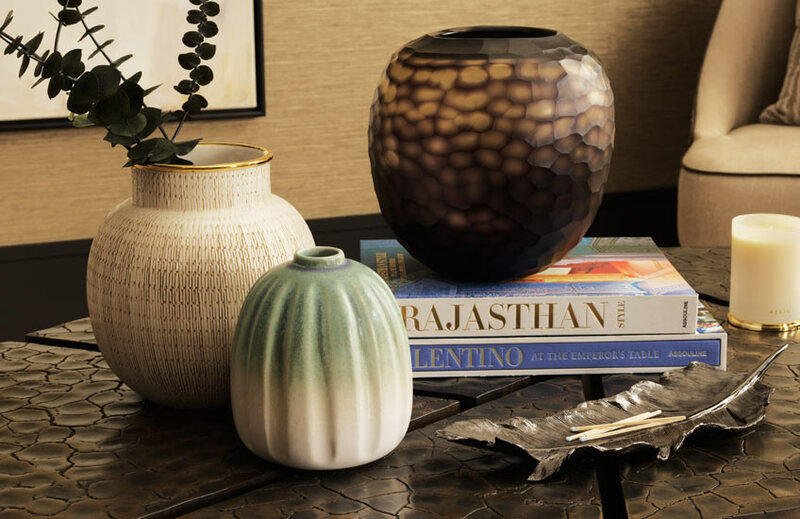 A diaphanous vase full of foliage (think low maintenance eucalyptus and grasses) takes the place of glass lanterns, and a detailed tray inspired by organic elements and a spicy scent complete the look. Add mementoes from your own travels for a personalised touch. Don’t fear, minimalists – you’re still welcome on the accessories train. But use your better judgement and don’t feel like you need to go over the top. Simple can be just as beautiful, especially when it champions such special pieces. Unique sculptural forms and understated decor works best when given some breathing space anyway. And if you want to incorporate an organic element, opt for a modern flower arrangement with structural blooms like orchids or calla lilies.